Ground-breaking technology to give athletes the most accurate, in-depth training feedback available today. Using a combination of Power, Cadence and Heart Rate along with the unique Polar View, you will experience the most effective training sessions ever. Power is the rate at which you transfer energy. Power is measured in Watts and is an excellent way to monitor your training. Watts can be used to establish training zones and track your progress with complete confidence. The incredible accuracy of the Wattbike makes sure you are always getting precision feedback live on the in-built performance computer. Cadence is the frequency at which you pedal and is measured by the Wattbike Performance Computer in revolutions per minute (RPM). Cadence can be manipulated along with the Wattbike air and magnetic resistance to produce specific power outputs required by your training programme. The Wattbike will measure your Heart Rate when using one of our Polar heart rate monitors. Training using power, heart rate and cadence allows you to ensure that you are training at exactly the right intensity for maximum improvement, and to pick up the rest signs of over-training, under-recovery or illness. 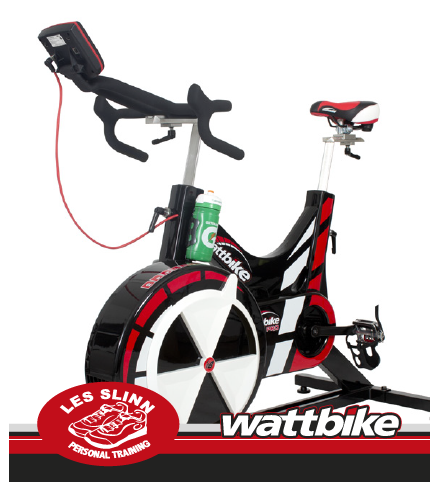 Wattbike – Leading indoor training bike in the world! Used by elite athletes from all over the world in sports as diverse as Cycling, Triathlon, Rugby, Athletics, Formula One Motor Racing, Football, Rowing and Skiing, the Wattbike is the ultimate training tool. tel: 01793 979151 mob: 07833582788 email: info@lspersonaltraining.com.